Starting today, and every Wednesday, I will pose nine questions to one of Colorado's winemakers and he or she will pose one to you and me. This new series is intended to introduce the people who make Colorado wine happen. Let the winemakers know that you care by commenting and responding to their question. For the inaugural "Meet the Winemaker" interview, I ask Jay Christianson of Canyon Wind Cellars nine questions and he asks two! 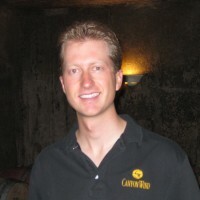 Canyon Wind Cellars was founded in 1991 by Jay's parents at the eastern edge of the Grand Valley. In 1996, the winery produced its first commercial wines. With the help of consultant winemaker Bob Pepi, Canyon Wind Cellars produces 14 wines utilizing low-intervention winemaking and sustainable practices. In 2011, Jay and his wife Jennifer took over the leadership and winemaking of Canyon Wind Cellars and started a new wine project called Anemoi Wines. The first Anemoi release, Boreas, is already a standout wine! A combination of things. The obvious answer is that my father planted the vineyard when I was nine years old, so it was a bit of a natural progression into taking over the winery. Though that is true, there was a lot more thought that went into it on my part. I was teaching in New Hampshire when sort of out of the blue it hit me: making something that people enjoy is possibly the most fulfilling thing to do. So with that in mind, I put the pieces into motion to take over the company. That is not to say that luck wasn't involved. I am truly fortunate to have met my wife in the skiing world and realize that she too has the passion and drive to make wine as I do; and that certainly helped with wanting to spend all my time at the winery when she does too. I would probably be slaving away as a ski coach. I really enjoyed ski coaching for the same reason that I liked teaching and that is that you can make an impact on someone and have fun doing it. Not to mention that you get to ski for a living. This time of year it is hard to imagine not being here! My wife and I love food so that is certainly part of our lives. Other than that we really love Colorado, so all the usual CO stuff: camping, hanging out in Silverton, hiking 14'ers, and skiing. All that of course when we are not trying to sell the wine too. I have to say that I am sort of lusting after Mourvèdre, mostly because I love the Rhône Valley. But truthfully, given my choice of planting something new I would either have to go with Petit Sirah or Zinfandel. Tough one - probably I would have to go with either Bordeaux or Lodi. Bordeaux because I am a huge blend guy - especially with the 5 Bordeaux varieties. I love the symmetry that a great wine from Bordeaux can produce. Lodi for zinfandel, pure and simple. I love a great zin and would love to work with it there and give it a go! The list of top wines is so long - they all have their place. I love Tokaji, great rosé Champagne is hard to beat, but I guess that I would have to go with a 1989 Figeac. There is just something about that bottle that expresses the land, and the brightness of fruit and just plain awesomeness. Sorry, I am a bit at a loss for words with this wine, is it too cheesy to say it spoke to me? I would go with Bryon Friedman, Mike Doughty (post Soul Coughing), and Gomez. Whatever they want as long as they put some in a glass and try a half dozen before they make up their mind about it. In a place much closer to where Washington was 5 years ago. Thanks, Jay! If I could change one thing, it would be to have Colorado wine on all restaurant wine lists in the state. I think restaurants need to support the industry more. As for what wine I want to see, first I think CO has the potential to make killer sparkling wine. Also, I think someone needs to plant Grüner Veltliner in the West Elks AVA. I'd love to hear what my readers think!